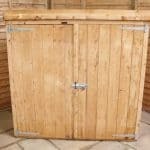 With security so important for garden buildings in today’s climate, many people turn to windowless sheds in which to keep their valuable gardening equipment. It stops people seeing what’s inside, but it also blocks out natural light making it a less pleasant environment to spend time in. This security shed, however, offers the best of both worlds by having high level windows that are tiny and yet allow a good amount of natural light to reach the interior. It’s not only prying eyes that are kept out, as we were pleased to find that this shed has excellent rainproof qualities. The felt covered apex roof is just one of its defences, forcing water away from the interior. This is also helped by the superior quality cladding used throughout, and the tightly fitting tongue and groove boards which mean that there are no gaps for water to seep through. There’s more storage space than you might at first think in this shed as well, thanks to the unusually generous eaves and ridge heights. It means that even tall items can be stored and retrieved easily, and the installation of optional shelving units allows the owner to use this vertical space to the full. 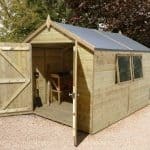 We’ve reviewed a lot of timber sheds that are designed with security in mind, but most of them feature a completely windowless design. We feel natural light is essential for a shed that people are going to spend extended lengths of time in, which is why we were pleased to see this one feature windows that are light enabling and yet still secure. 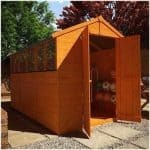 It also creates a shed which has a traditional and yet unique look, that we feel will look attractive in any garden setting. It was good to see an apex roof at the summit, and its impact can be seen not only when rainwater is channelled away, but also through the shed’s tall stature.The ridge height of 2.46m and eaves height of 1.85m ensure that there’s plenty of space to move around in. Other dimensions to note, particularly when choosing the best spot to locate the shed, are the overall width of 2.44m and the overall depth of 3.66m. 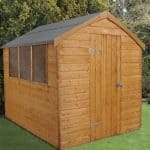 The feature we liked most about this shed is the tough PAR cladding that is used. It shows that no corners have been cut in its production, with the same tongue and groove used for the walls, roof, and floor. It’s 12mm thick, which we find is pretty standard among tongue and groove clad sheds of this size, but unlike most it features planed all round cladding that gives it extra strength and rigidity. This is also enhanced by a thicker than average frame size of 44 X 27mm, giving increased stability. Whilst it was good to find the floor itself made of this reliable cladding, rather than a more cost effective option such as OSM, it was disappointing to find that pressure treated floor joists were absent. These are essential, in our opinion, to keep the threat of rot away from the base. 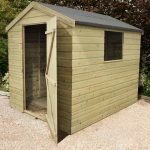 For a shed that costs in excess of a thousand pounds, we would have expected it to have been pressure treated before delivery, a process that forces preservative deep into the fibres of the timber, and to have a long extended warranty. 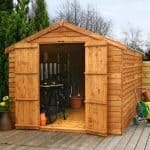 Both of these are absent here, and instead there is only a basic one year warranty period and an onus on the customer to treat the shed themselves with a high quality wood preserver on an annual basis. There is also a requirement for the customer to treat the shed six weeks after installation, so it’s a good idea to leave at least a foot gap on either side to make this treatment process a little easier to carry out. We were pleased to find that the door was accommodating for even taller users, with a height of 1.88m, as having to stoop down while carrying items inside can bring health and safety concerns. 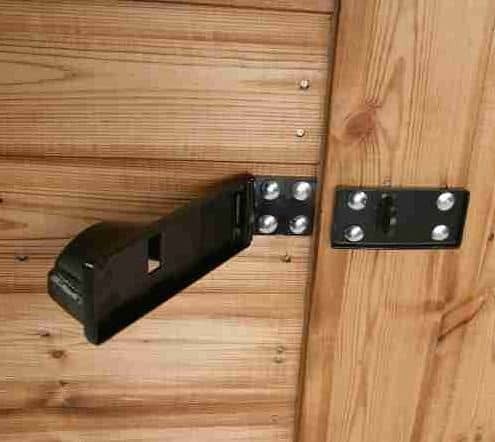 The width of 0.76m is also wider than most single hinged doors we find on the wooden sheds we review, and the door as a whole seems strong and sturdy. The windows caught our eye at first sight. There are four of them and they are small and positioned high up on one side of the shed (as the panels are interchangeable, which side they’re positioned on is down to the owner), but still allow an adequate amount of light to come in. We were also glad to see that they feature horticultural glass, which although clear is around twice as thick as some shed glazing we see. The windows themselves are the primary and most effective security feature, in that they’re impossible to gain access through because of their size, difficult to shatter, and make it very difficult for people to see if anything of value is being kept inside. We also liked the padlock protector, which is a tough and useful feature, although of course it’s of no use without a padlock, which is why we were surprised to see this essential security device missing. We highly recommend that one is purchased at the same time as the shed. One optional extra is a set of wooden floor bearers, priced at £61.99, but in our opinion these, or integrated floor joists, should have been included as standard. It’s important to raise timber sheds above ground level, as this is often an area with a high moisture content and where water will rise into the wood itself if not prevented from doing so. Without these bearers, rot could quickly establish itself. There’s also an option to take up a professional installation service. We were pleased to see this, as we know that for many people it’s hard to find the time to do the assembly themselves, even if they have the confidence to do so. At £99.99, we think it’s reasonable value to save time and ensure a perfect installation. It was good to see that all the components used were of the highest quality, even down to the rounded edges on the frame. The lack of pressure treated floor joists, and the use of a one coat dipped treatment, could have an adverse impact on the shed’s durability. We were pleased to find such a tall eaves and door height on this security shed, as it makes a big difference to how much can be stored within it, and how easy it is to manoeuvre objects in and out. The assembly instructions are relatively clear and easy to follow, and all the fixtures and fittings are included. This means that you and a friend should be able to complete installation in around six hours, unless of course you relax and use the optional installation service. Whilst the storage size and build quality are good, at this price we feel the value for money is let down by the short warranty period and the lack of pressure treated timbers. 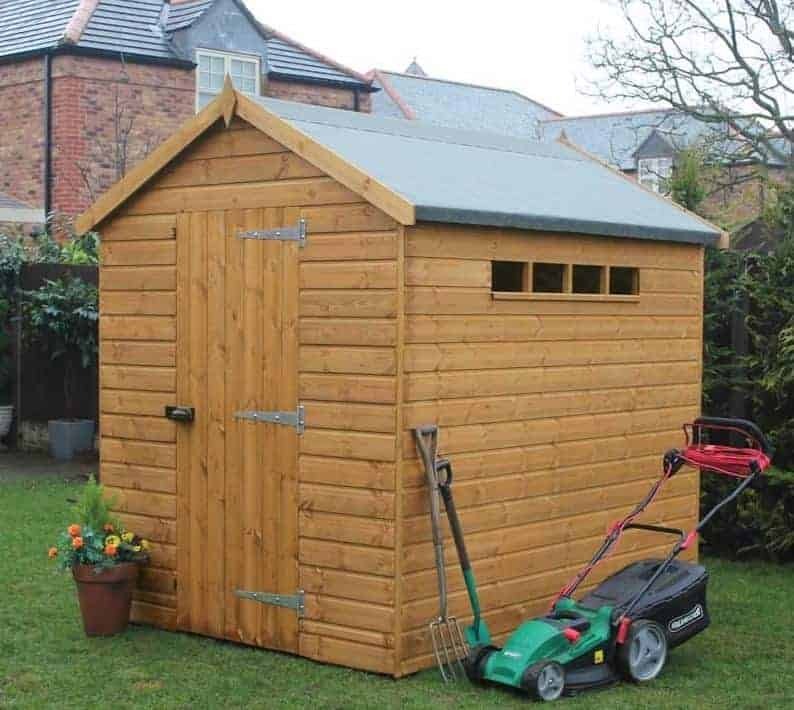 Final Thoughts: If security is the most important thing to you when choosing a shed, and yet you still want the traditional appearance that timber provides, then this is well worth consideration. We really liked the windows; they represent a smart solution to the problem of getting light into a secure storage facility. Of course, a padlock will need to be added in order for the shed to be used for the purpose for which it was designed, but these can be acquired relatively inexpensively. Once attached, the padlock protector gives it added toughness, and the appearance alone can deter some opportune thieves.